Companies shedding their workforces due to advancements in AI, automation, and robotics, leaving people to come up with alternative ways to make money. Mass adoption of mobile technologies that allow anyone to consume anyone else’s content. The rise of streaming platforms that allow individuals to project their personalities and skillsets into the world. The commoditization of production and creativity tools that allow smaller organizations and even individuals to produce high quality content. The realization by business people that—because of the other factors above—value creation increasingly comes from the content creator, and not with the middlemen that stand between them and the consumer. The combination of these forces are pushing people to platforms like YouTube and Twitch to broadcast themselves, grow an audience, and to monetize their following. There are already a couple hundred thousand people doing this, with the top percentages doing the work full-time and making a significant living from it. As I wrote about here back in 2014 and talked about in my book, the Future of Work is everyone being an Uber driver—except for every skill they have. We’ll all run an application called Work, and within this system you’ll have all your skills, your work history, your certifications in each skill, the ratings you’ve received for previous jobs you’ve done, recommendations from people you’ve worked with in the past, etc. Think LinkedIn + FICO + the Uber app, except for any job type. People are often able to do many different jobs, with varying degrees of skill, and those will be reflected in the system. People will be listed as a paralegal, a catsitter, an EMT, a Krav Maga instructor, a personal organizer, a public speaking coach, writer, a Good Listener, a plumber, a bassist, a poet, an editor, a bouncer, etc. And everyone—both people who need jobs done, and those who are available and qualified to do those jobs—will be running the Work app. Incoming jobs will simply flow into you based on your qualifications, your work history and ratings, your preferences, your location, and your availability. Imagine incoming offers of various kinds being displayed Tinder style—first on a mobile phone like today, but they’ll soon be read to you by your digital assistant, or shown to you in AR. Either way, you’re simply accepting or rejecting various gigs based on your own criteria. Find me someone to edit this article I just wrote. And in 15 seconds they’ll return with 3 bids for you to choose from, which were handpicked from among 1,112 good options, which were picked from 234,981 options available. 10 seconds later you’ve made your selection, and within 15 minutes someone highly qualified is working on the job. With fewer and fewer people working exclusively for one company doing one thing, this will become the Future of how work is done throughout the world. Being an influencer in this new economy will be a massive advantage. It’ll still be possible to have a successful career (if you can call it that) without marketing oneself because the Work platform will make your skills and ratings visible to people who need them, but it won’t be nearly as effective as being an influencer as well. Most importantly, influencers will become known for doing what they do. That might be professional gaming, it might be music, art, comedy, blacksmithing, executive protection, martial arts, short stories—whatever. There are already many (and will soon be infinitely more) ways to broadcast oneself as an influencer. You don’t have to sing or even be social necessarily. Some people just draw, or paint, or do whatever they do with their fans watching, and rarely say much at all. Others have very little content and just be their crazy selves. Both approaches can and will attract followings, as long as there is some core value being transferred. Sign me up for a one week class with TheSketcher. *TheSketcher then raises her prices and is soon making incredible money doing a few high-paid gigs per year. This will still be possible without being an influencer, but it will be harder and take more time. IMAGE 1. — Removal of the middleman. Another major change I see coming to the concept of influencing is in the way platforms work. Right now platforms such as YouTube and Twitch are very much middlemen. They’re quite analogous to the record companies, Hollywood, and other organizations that serve as gatekeepers between content creators and audiences. You must use them in order to reach your fans, and if you don’t you cannot be heard. But that is changing, too. In the entertainment world we’re seeing the lines blur between content creator, distributor, network, and whatever other categories used to exist. 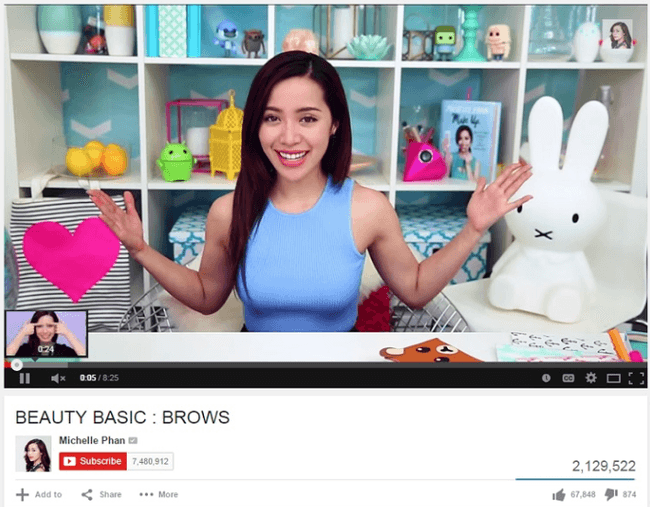 They seem to be collapsing into two main entities: content creators, and the audience. Distributors and other support entities are now having to justify their existence, which is a change I absolutely welcome. So what I think we’re about to see is a completely different kind of platform—an agnostic one that provides mostly bandwidth and sets of enablement tools for content creators and influencers. So instead of an influencer being forced to live on YouTube, or Twitch, or Beam, or wherever—where they don’t have a direct tie to their audience, they aren’t able to easily reach out to that audience directly, and where the benefits most from monetization—I think we’re going to see agnostic broadcast platforms that allow audiences to connect to the influencer directly. The difference is subtle, but transformative. 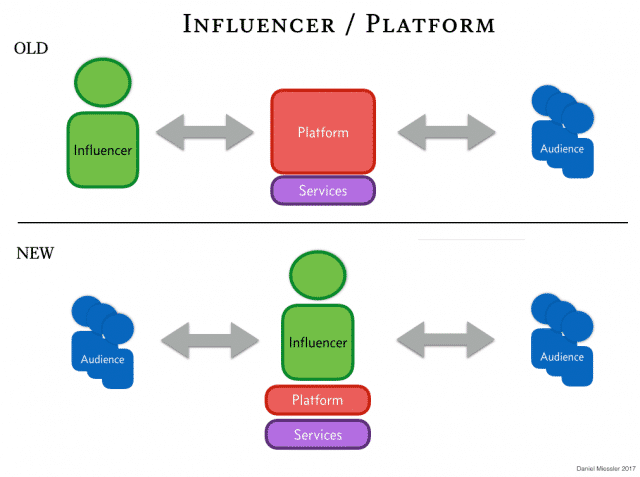 Rather than platforms being a middleman making all the money and controlling influencer audiences, the platform will just be the broadcast medium for the influencer themselves, and any services that want to benefit from the influencer’s reach will have to market themselves to the influencer. They won’t be in the middle. OLD PLATFORM-CENTRIC MODEL: You’re lucky I let you live on my platform and give you access to our unbelievable audience. You will pay me this amount or I will kick you off. You will abide by all of our rules, or I will kick you off. And you’ll like it. NEW INFLUENCER-CENTRIC MODEL: I’ve selected your bandwidth platform from among one of many, and I agree to give you 4% of my profits. While I’m small I won’t cost you much, and when I get big you’ll make a lot off of me, which I’m happy to give due to your great service. And it’ll be the same with sponsors, advertisers, free gifts, promotions, and the dozens of new services and monetization models that will emerge to serve the influencer and benefit from their reach. Not everyone needs to try to become some internet celebrity in order to prepare for what’s coming. The best thing you can do is start asking yourself the following questions. How would you summarize yourself? What are the top skills that you would like to be known for? What could you just talk for hours about if someone would listen? What are you trying to achieve in life? What do you find interesting in the world? And for all of these questions…why? The answers to these questions are you, and they constitute what you project onto the world. Knowing what you’re about and what you can offer to others is going to become extremely essential in the new economy. In the past we had companies marketing themselves, with the employees doing the work that they found. When people are forced to work for themselves, that marketing falls on the individual. It’s time to get yourself and those you care about ready for what’s coming.